Holy Week can never be the same for me. Not after seeing the Shroud of Turin last year. 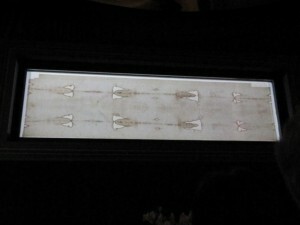 It’s been nearly a year since the Shroud was placed on public display (for just the 18th time in its history) in Turin, Italy. Never did I imagine I would be among the over two million pilgrims and also have with me my newly-confirmed 14-year old daughter Teresa and two of her friends to see the Shroud last year. What Do we Know about the History of the Shroud of Turin? The Shroud of Turin is a 14-foot long by 3.3-foot wide linen cloth that bears the faint image of a crucified man. Millions believe that man to be Jesus Christ. It is said to be the most scientifically studied Church relic ever. And still the origin of this image is debated among scientists, historians and theologians. 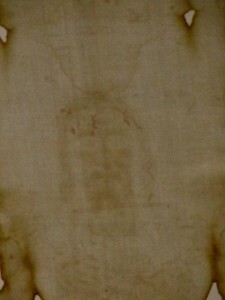 While no one would ever be required to “believe” that the Shroud of Turin is the actual burial cloth of Jesus Christ, one thing is clear: to this day none of the skeptics can accurately tell us how this bloodstained, linen cloth come to bearing the image of a photographic negative of a crucified man. This description of “an image not made by human hands” first comes to us in references about an ancient cloth said to bear an image of Jesus Christ. It was known as the Image of Edessa, the Edessa Cloth and later during the Byzantine Era as the Holy Mandylion. Edessa was a great city during the time of Christ, now known as Urfa in modern day Turkey. There is a high level of certainty amongst scientists, religious scholars and historians that the Shroud of Turin is this ancient cloth. It is said that this cloth came to Edessa to King Abgar V Ouchama of Edessa (13-50 AD) by the Apostle Thaddeus. This was documented in Eusebius of Caesarea’s early 4th century Ecclesiastical History. He writes about a document once in Edessa’s archives that had been written by King Abgar V and delivered to Jesus by an envoy. 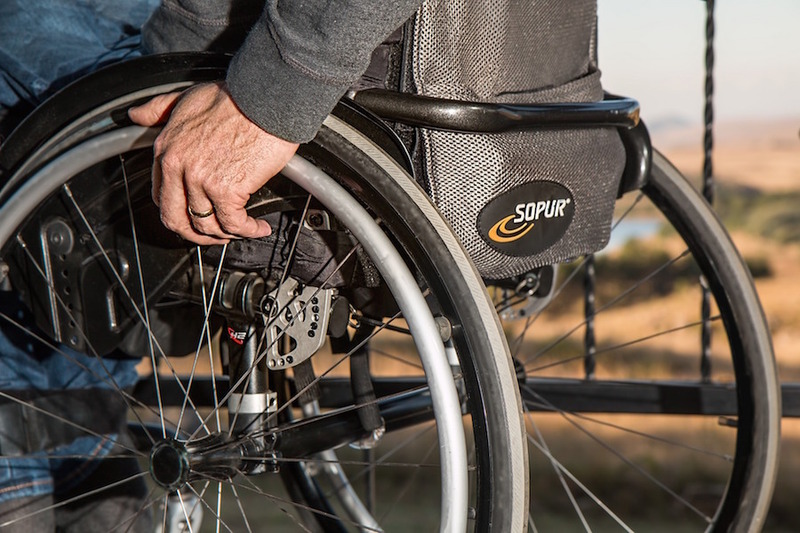 The King asked Jesus to come to Edessa and to cure him of leprosy. The history reports that the Apostle Thaddeus was sent sometime after Jesus’ death and that he founded a church in Edessa. A separate Syrian manuscript, the Doctrine of Addai confirms these details and adds that a “portrait” of Jesus accompanied Thaddeus. It referred to the Edessa Cloth as a “tetradiplon.” A tetradiplon means a cloth doubled in fours, so that only the face in the cloth would be visible. King Abgar was cured of his leprosy and there were many conversions to the new Christian faith because the King was cured and because of the Image of Edessa, which attracted people to the faith (much in the way Our Lady of Guadalupe would convert millions centuries later in the New World). 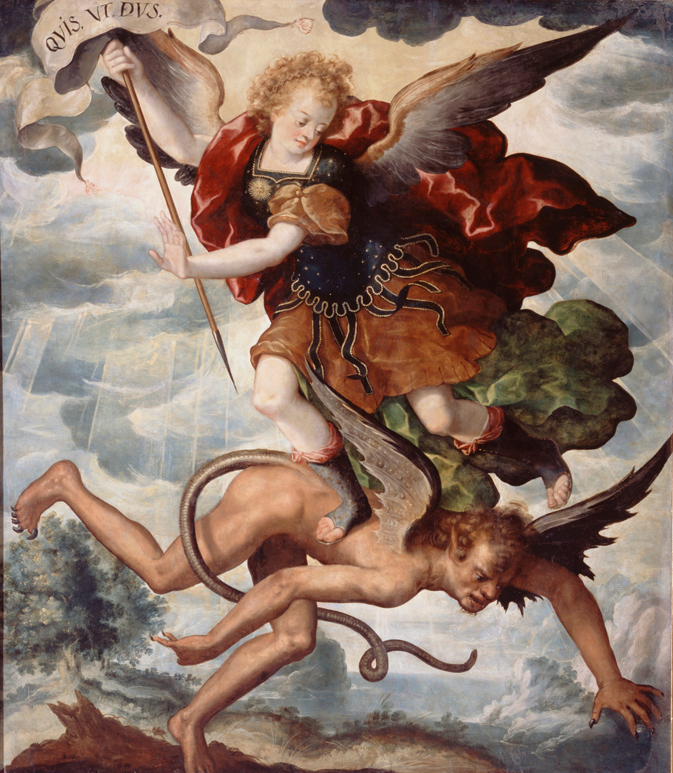 But over the next four centuries the people begin to lose their faith and those who were in possession of this Image hid it inside the walls above one of the city gates in Edessa. They were fearful that it would be destroyed. The cloth was eventually lost, or forgotten about, until the year 544 AD when it was rediscovered during a Persian invasion and placed in a new Church built especially for it. In the late 6th century Evagrius Scholasticus’ Ecclesiastical History mentions that Edessa was protected by a “divinely wrought portrait” sent by Jesus to King Abgar. In 730 AD St. John of Damascus in his book On Holy Images talks about the cloth as a “himation”, which is translated as “an oblong cloth or grave cloth.” This is the first time we can be certain that the historical references are not simply to an image of the face of Jesus, but in fact an entire image of the crucified body of Christ. In 944 AD there was an attack on Edessa again, this time from Muslim invaders. The Cloth of Edessa was transferred to Constantinople, the Byzantine capitol city now known as Istanbul in Turkey. When the image arrived the Archdeacon of the Hagia Sophia Cathedral preached a sermon about the cloth being a burial cloth, believed to be that of Jesus and that it contained bloodstains. There are several historical documents that referred to the Image over the next 250 years. In 1204 the Shroud disappears from Constantinople when the city is sacked by Knights of the Fourth Crusades. The Knights seized numerous relics because of the invading Muslims and once again removed the Shroud. In 1207, Nicholas d’Orrante, Abbott of Casole and the Papal Legate in Athens wrote about the relics taken from Constantinople by the Knights and referred specifically to the Shroud saying that he saw it “with his own eyes” in Athens. A French knight, Geoffrey de Charny, is the first identified owner of the Shroud after this time and he wrote to Pope Clement VI that he wanted to build a church at Lirey, France for the Shroud. The year was 1354. Large crowds came to visit the church at Lirey to view the Shroud and special medallions were struck. The Shroud remained in the De Charny family for about 100 years until it passed to the Savoy family. By 1532 the Shroud had been moved to several different locations for security and veneration reasons. And that year the Shroud suffered fire damage in the St. Chapelle Chapel in Chambery, France. It had been located there since 1453. Burns to the cloth resulted from molten silver from the reliquary box in which it was stored and produced symmetrical marks in the corners of the folded cloth. Poor Clare nuns attempted to repair this damage with patches. There were also a number of water stains caused by the extinguishing of the fire. In 1578 the future Saint and then Cardinal Charles Borromeo wanted to take the dangerous journey on foot from Milan, Italy to Chambery, France to give thanks in front of the Shroud in thanksgiving for Milan being spared from the ravages of the plague. To save Borremeo such a journey across the Alps, the owners of the Shroud ordered that it be transferred to Turin. It has remained in Turin ever since. What do we Know about the Science of the Shroud? It would take several books or websites to get into all the scientific testing that has been done on the Shroud of Turin. (And there are, indeed, several dozen books and websites devoted to the science of the Shroud, posted at the end of this article). Suffice to say that the real testing began in 1978 when several scientists were given access to Shroud for five days. It is known by the acronym, STURP or Shroud of Turin Research Project. For 120 hours, in 1978, the STURP scientists photographed, x-rayed, pressed sticky tape, took samples from the bloodstains, did spectra analysis tests and snapped thousands of photomicrographs of the Shroud. Three years later they released their findings, and more than 30 years later their study has not been notably contradicted. Among the STURP findings: No pigments, paints, dyes or stains were found on the fibrils of the linen cloth. It is not a painting. 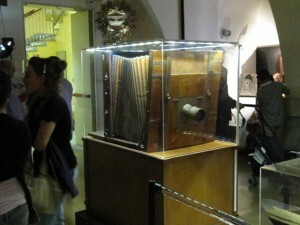 An image analyzer shows the Shroud has a unique, three-dimensional codex embedded in it, unlike any other two dimensional image made by humans. While some explanations of what caused the image on the Shroud are possible from a chemical point of view, there are precluded by physics and certain physical explanations are conversely completely precluded by the chemistry. To explain the Shroud image there must be a complete explanation from a physical, chemical, biological, and medical standpoint. To date no one has presented this complete solution. It is an enigma. The scientists also determined that there is evidence on the Shroud to show that it has pollen on it that can be traced to all the known locations at the specific times in its history: from Jerusalem to Edessa to Constantinople to Athens to locations in France and Italy. In 1988 Carbon-14 tests seem to indicate that the cloth was dated to between 1190 and 1350 AD. This led some to believe it was a clever medieval forgery. But since that time those results have been called into question on a number of levels and now the Carbon-14 tests themselves have been largely discredited. When I originally booked our free Shroud of Turin tickets online in the United States before flying to Italy, I had hoped to have at least 3 or 4 viewing times and spend at most 10-12 minutes total in front of the Shroud. God had other wonderful plans for us. 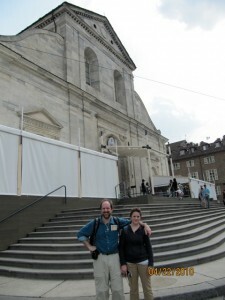 After a 30-hour odyssey of flying from our homes in North Dakota, making train connections through Rome to Milan and Turin, checking into our B and B and then hiking 20 minutes on the ancient cobblestone streets and plazas of Turin, we finally had our first chance to stand in line with others to see the Shroud of Turin. Coming up to St. John the Baptist’s Cathedral, the early evening sun lit up the old dome perfectly and we found out where to line up to prepare for our viewing. I had expected to wait for hours. In just over 20 minutes we were ushered into the sanctuary and beheld the Shroud. The Man in the Shroud seemed to be very real, profound, serene, surreal, peaceful and holy. I felt a tear in my eye as I prayed both in thanksgiving for being there (it is good to be here Lord, I remember saying!) and for the love that Christ outpoured for his creatures during his time on the cross. The next day we went to Mass at one of the 68 Catholic churches that are nearly everywhere you walk in old Turin. By chance it was the church of St. Charles Borremeo, dedicated to him in 1609, the former Archbishop and Cardinal from nearby Milan who, by wanting to hike to France to see the Shroud, is credited with having it being brought to Turin in 1578. Following Mass we made our way to the Shroud Museum. Inside were remarkable photos, paintings and depictions of where the Shroud is believed to have been through the last 20 centuries. For those who wonder if the Shroud was a medieval forgery, there were plenty of scientific and contemporary records through the centuries to show that the Shroud has indeed existed since the time of the burial of Christ. After a brief lunch we walked the few blocks to get in line to see the Shroud again. And just like the evening before, we were ushered into the darkened Cathedral of St. John the Baptist to be given a chance to stand six feet from the “image not made by human hands.” We then decided to visit the Turin Diocesan Museum located underneath the Cathedral. It was a choice that my daughter Teresa and her two teenage girl friends fought me on a bit, because we had already seen the Shroud Museum and they “strongly” felt that they wanted to wander around more and perhaps do some shopping for presents to take home to family and friends. I insisted on seeing this museum. And like all things, God was guiding us this trip and He had a happy surprise for us following our museum tour. The Turin Diocesan Museum contains samples of the architecture, art and archeology of the Cathedral that dates back through the last 18 centuries. We learned that the Cathedral was founded during the very earliest Christian times and built next to the existing Roman walls at the side of a theater, the ruins of which are still visible under the massive Cathedral. At the end of the tour we came out of the Cathedral basement and were led back to the front steps. Behind us was that same line of people waiting to get in to see the Shroud. However, this time the doors to Cathedral were open and people were walking inside to the main body of the Church, so we looked at each other and followed them inside. I had wondered about the people behind us in the pews in the main body of the Cathedral who were kneeling and praying when we came down the side aisle and had our three minutes in front of the Shroud earlier in the day and the evening before. I thought you needed special permission, or had to have a special pass. Turned out you don’t need anything at all. While you were not six or ten feet away from the Shroud, you still had a wonderful view and could be as close as 25 feet. And so my daughter Teresa and her friends Rebecca and Samantha found out that by going to the Diocesan Museum, somewhat against their will, they were able to sit, kneel and even stand for well over a half hour as we venerated this mysterious Shroud. We watched the comings and goings of thousands of pilgrims, like we had been, and listened to that beautiful Italian prayer over and over again said so reverently each time for each new group of pilgrims. We prayed rosaries, said Chaplets of Mercy and just sat in silence, knowing what a special 30 minutes we all were having together. As we left we found out that Mass was said there at 7 a.m., and so we planned to be back the next day. There are certain Masses we all remember. Some of us remember our First Communion, Confirmation, Marriage and other special ones. I will always remember the day when I took part in a Mass, concelebrated by 10 Italian priests, in front of the Shroud of Turin at St. John the Baptist’s Cathedral in Italy. Attending this Mass gave me a sense of wonderment when I realized where this linen cloth has purported to have been these last 20 centuries. How many people have stood before this bloodstained and ancient cloth? How many received the body and blood of Christ in front of this holy cloth? His last moments before passing into His eternal reward are mysteriously etched onto the Shroud. The Apostles were the first to see this linen cloth, King Abgar then was cured of his leprosy and its journey from there has meant it has been at Mass before literally millions of the faithful through 20 centuries. I couldn’t help but think when Peter entered the empty tomb and saw this linen cloth lying inside “and believed,” could it have been this imprint I was looking at on the Shroud that helped him and the others overcome their initial unbelief? Here I was at a Church built on a site of earlier Catholic churches that dated back to the 3rd century. Mass has been said here for well over 1800 years. 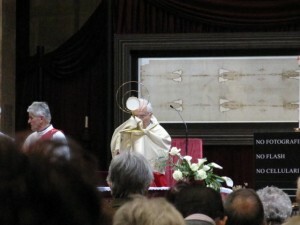 At the precise moments when the priest lifted up the bread and wine to confect them into the Body and Blood of Christ, my eyes lined up with the Shroud through the Eucharist. There were the bloodstains, there was the crucified body, and there was our Creator who suffered, died and was buried for all of us. Emotionally and spiritually I knew that communion would never, ever be the same for me again. We are the body of Christ. There was the body of Christ. Transubstantiated by the Italian priests and physically represented in one of the Church’s most venerated relics. 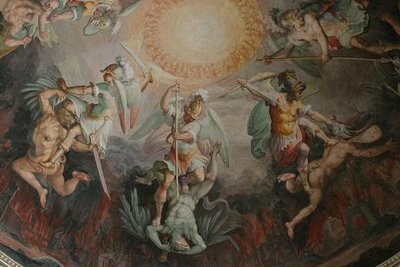 The choir began to sing angelically as we all went up to receive, with my eyes focused again on the Shroud. Then the Mass at St. John the Baptist’s was over. I walked forward to the front pews to kneel and say a Rosary and a Chaplet of Mercy. Finally, sadly, it was time to leave. While the rest of the trip to Pisa, Lorenzana, Assisi, the Vatican and the rest of Rome was spectacular, nothing will compare with the first two days in Turin. It is two days that I can never forget. The Shroud remains at the Cathedral in Turin, but its next public viewing is not scheduled until the year 2035 (unless there is a special opportunity permitted as there was this time). As noted before, it will never be a requirement for those in the Catholic faith to accept that the Shroud is the true burial cloth of Jesus Christ. After seeing it four times and spending nearly three hours in front of it, we know there was a linen cloth 2,000 years ago that was used to bury our Lord as He was laid in the tomb. Science has not been able to replicate this bloodstained shroud precisely or prove that it is not what it is purported to be. That is what I reflect on daily after seeing the Shroud of Turin. That I should not complain about what minor sufferings I think I may have to endure in my life. What we see on the Shroud of Turin, and know from the accounts of the Gospel, no man suffered more, for all of humanity, than God Himself. Mark Armstrong can be reached through www.RaisingCatholicKids.com.